It’s weird how when Scott Pruitt does stuff he isn’t supposed to do—so, most days—those things always end up being kind of depressing, eliciting the same very particular sort of bored carsick feeling that I always get while standing in line at the post office. This time? The Washington Post reports that Pruitt had his executive scheduler at the EPA set up a meeting with Chick-fil-A president Dan Cathy in order to discuss a potential job for his wife operating a Chick-fil-A restaurant. Marlyn Pruitt never opened a restaurant. “Administrator Pruitt’s wife started, but did not complete, the Chick-fil-A franchisee application,” Kurlander said. 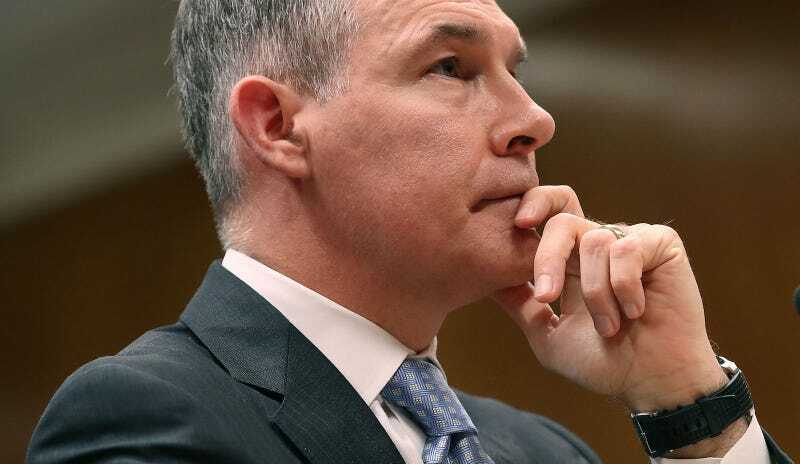 But the revelation that Pruitt used his official position and EPA staff to try to line up work for his wife appears to open a new chapter in the ongoing saga of his questionable spending and management decisions, which so far have spawned a dozen federal probes. Pruitt’s efforts on his wife’s behalf — revealed in emails recently released under a Freedom of Information Act request by the Sierra Club — did not end with Chick-fil-A. Pruitt also approached the chief executive of Concordia, a New York nonprofit organization. The executive, Matthew Swift, said he ultimately paid Marlyn Pruitt $2,000 plus travel expenses to help organize the group’s annual conference last September. Sources told the Post that Pruitt was “frustrated in part by the high cost of maintaining homes in both Washington and Oklahoma,” and wanted his wife to start earning a salary. How very relatable to recognize the necessity of a two-income household, as we all struggle to get by as best we can. Best of luck to Marlyn Pruitt in her job search.